There’s a thriving community of Aprilia Futura owners worldwide, but it’s easiest to find other owners online. You’ll find these on the Apriliaforum and the Aprilia Futura Facebook Group. 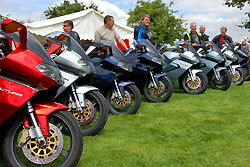 You’ll find mainly UK based riders on The Aprilia Ridersite Forum. The Futura attracts a loyal and dedicated following in France and the French annual meeting each May is usually well-attended. More details are available on the French Futura website. The German Aprilia meet is open to Aprilia owners from all over Europe. More information is available at the ApriliaTreffen website (in German) . These links have not been tested in a while so I can’t guarantee they work! There isn’t a Futura owners’ club as such – at least not in the UK – but there are many online communities for owners. The daddy of them all is the AF1 Futura forum, where you’ll find owners from all over the world offering advice and arranging meets. It’s free to join and members are helpful and polite. Mostly. There’s also a Futura-based mailing list on Yahoo groups. Many of its members are also on the AF1 forum. There’s also a Futura section on Aprilia Ridersite , a British site. The Futura has a devoted following in France, and French owners have their own site and forum devoted to the bike, RST1000.info . It also has an English language section on its forum. There’s an Italian Futura Forum and the the Italians also started the I love Aprilia RST1000 Futura group on Facebook. Thanks to Zag07 for the info! In the UK, there are a few Futura owners to be found on the Club Aprilia forum, though you have to be a member to post there. The club has a section of the forum devoted to Futuras, Caponords and Falcos but the AF1 forum is far busier. If you want to suggest a link, then get in touch. Wolfie’s Futura site came back on line in April 09 after disappearing for several months. It doesn’t get updated these days but there’s some useful stuff on there. Divers modifications is a mini site with info on modifications including English versions, while Befbever’s site has manuals and tech info, pictures and videos in the Futura folder. Ken’s Falco site is a mine of information on the SL1000, which means there’s some useful how-to’s for Futura servicing, including oil changes and valve checks. Todd’s Capo site is also useful since the Caponord and Futura also share a lot of parts. More links are available on the Apriliaforum links page. Club Aprilia is the official UK owners’ club. If you want to nominate a link, then get in touch or use the comments box below.